Development length can be defined as a length of reinforcing bars into embedment of concrete required to develop full tensile strength of them. This length depends on either splitting or pull-out failure. 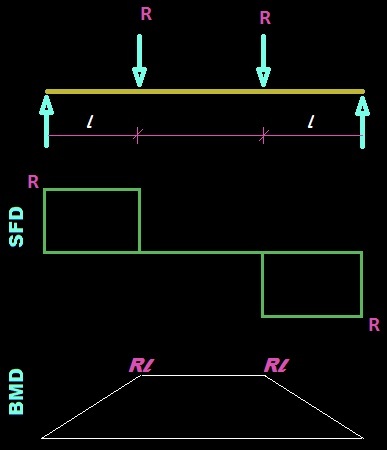 According to figure 01 the moment is obviously maximum at point a (not considered weight of beam); maximum moment means maximum stress on steel. As the beam is simply supported, end restraint is zero which means zero moment at support. Let’s try to analyze this problem. If the stress in bar at a is fs and area of bar is Ab , the tension force in bars is Abfs; this means, this force has to be transferred to concrete from bar. To transfer this force by bond force, l length of bar is required. The strength of bar is Abfy; to develop this strength, the length of transferring force, (here l) must be equal or more than development length. If development length is ld, when l ≥ ld , bond failure occur after mobilizing full strength of bar (Abfy) i.e. premature failure is avoided. Thus, the beam may fail due to other type of failure like shear or bending, but bond failure is restricted.The beam is safe even when local slip is occurred near cracks across small regions on the beams. Notice that, the main safety requirement for failure due to bond is only length of reinforcing bar. This length from a point of given stress in steel (fs or anything ≤ fy) to nearest free end should be equal or more than development length of it. Where jd=Lever arm between resultants of compression and tension force. If proper development length is provided, magnitude of nominal flexure bond force, as in equation (1), is not very important as integrity of beam is ensured; this is valid even under local minor bond failures. When actual length provided is not adequate i.e. full development length, however, cannot be provided,special anchorage like by hooks, should be provided.